The MOD1 Cockpit Light comes in three different colors. White, which can be dimmed for night vision protection and still allow all of the colors on the sectional chart to be visible; Red, historically 'night vision safe’; and Green. The Red and Green generally don't need dimming, and can be used for general panel or interior illumination. 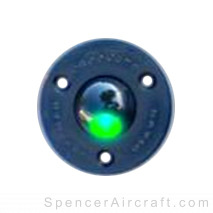 The Green LED, the latest to be introduced, is psychologically soothing and is ideal when using Night Vision Goggles. Units operate on 14 volts dc and will work with 28 volts using a dropping resistor. The LED’s are mounted using a swivel to allow the light to be directed where you need it. Manufactured in the USA.